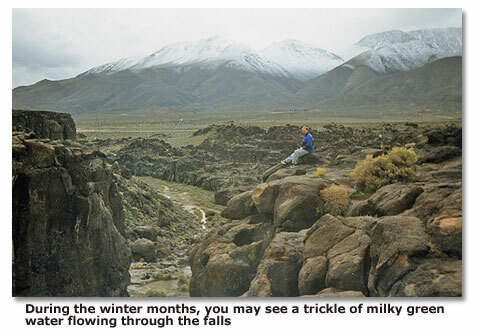 If you go to Fossil Falls, located just off U. S. Highway 395 on the east side of the southern end of California’s Sierra Nevada, don’t expect to find either fossils or falls. What you will find, rather, is a spectacular lava flow sculpted by rushing water and wind late in the Ice Agesa “fossil” of nature’s handiwork. As you hike the rocky trail through the formation, you’ll wonder at first where the “falls” are because the land immediately before you is relatively flat, but abruptly, you’ll come to the chasm that reveals the spectacular lava falls. 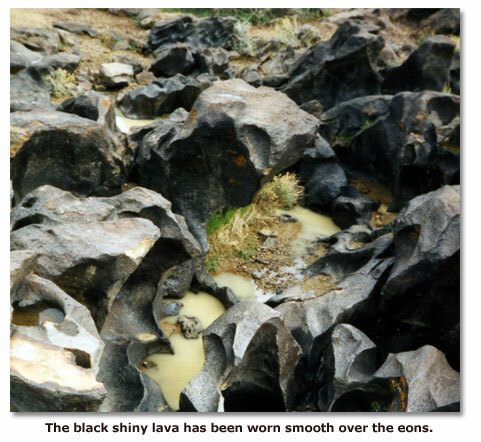 The black shiny lava has been worn smooth over the eons. It was primarily water from the Owens River, which once flowed from an ancient lake, that polished the lava into a smooth structure. The resulting formation is reminiscent of a Renoir sculpture. You can climb down into the chasm and explore the lava gorge, or you can take the high ground and enjoy the scenery that surrounds you. During the winter months, you may see a trickle of milky green water flowing through the falls, making a striking contrast with the dark lava. It is like watching art in motion. 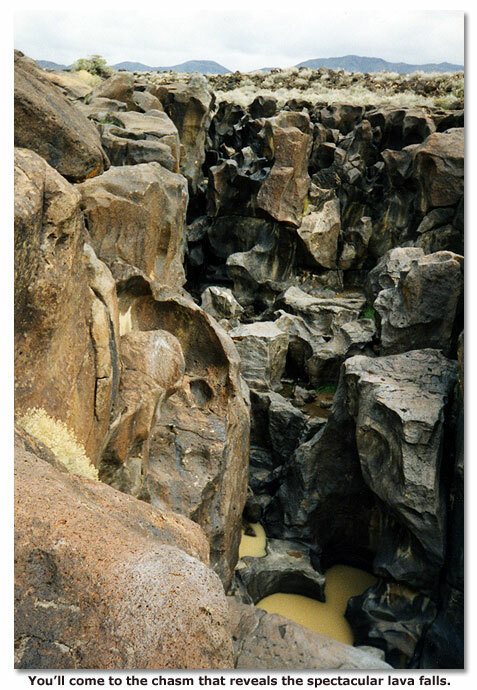 Fossil Falls is also attractive to rock climbers since it is a little known spot with solid “finger-friendly” routes. Several established routes have difficulty ratings ranging between 5.1 and 5.9. When visiting the area, you will also likely see the prominent cinder cone volcano known as Red Cinder Mountain, or Red Hill. According to David R. Jessey, geology professor at Cal Poly Pomona, the volcano erupted last about 10,000 years ago with evidence suggesting a more recent, relatively minor eruption on the northwest flank of the volcano. When looking southward, toward Little Lake, you’ll see several basalt flows. Jessey says that the Upper Little Lake Ranch basalt has been dated at about 130,000 years old and the Lower Little Lake Ranch basalt at about 400,000 years old. The overlying Red Hill basalt has yet to be dated, but estimates range from 10,000 to 130,000 years. While the area is an arid desert now, water once flowed from Owens Lake through the narrow valley to create an interconnected system of lakes that are now dry basins. If you look north from Fossil Falls toward Red Hill, you can see remnants of one of the ancient lakes in the form of white sands and silts on the Red Hill Playa. When lava from volcanic eruptions flowed through the valley, the streams followed the Owens River’s path, creating a river of lava that remains to this day. In addition to lava flows and river systems, the Owens Valley was once covered with glaciers. Melting ice and glacial movement coupled with other elements helped smooth the lava into the artistic, fluid forms we see today. Looking to the east you will see a dome-shaped hill with a mile-long black scar. This black marking is a streak of obsidian, or “volcanic glass.” Early cultures chipped the obsidian into high quality, razor-sharp projectile points and tools. You’ll still find obsidian flakes, products of the chipping, around the Fossil Falls area. Artifacts and rock art from the Fossil Falls area point to a culture that lived here between 10,000 to 20,000 years ago. These ancient “Paleo” people lived along the lakes and rivers and hunted big game such as the wooly mammoth and the mastodon. When the lakes and rivers dried up, the big game died out, becoming extinct for uncertain reasons, and the people had to move on to other areas and change their patterns of subsistence to find new game and food. Today, Red Hill is mined for volcanic rocks. When molten lava erupted through a vent in the Earth’s crust, it cooled quickly, forming a porous rock called “scoria.” The scoria built up around the vent and formed the cone-shaped hill that you see today. The scoria is used for a variety of commercial purposes. Fossil Falls has a campground with about a dozen campsites, four of them suitable for motor homes. Each campsite costs a $6 fee per site per night with a 14-day limit for a stay. Day use is free. The campsites are minimally equipped. You’ll only find a fire ring, a grill and a picnic table. A pit toilet is located nearby. Bring your own portable canopy because shade is scarce. Bring plenty of water unless you don’t mind using a hand-operated water pump. Plan to carry out your trash. The nearest sanitary dump station is six miles north of Fossil Falls on U. S. Highway 395 at the Coso Rest Station. Fossil Falls is located about halfway between Owens Lake and Ridgecrest just north of Little Lake on the east side of U. S. Highway 395. If you’re approaching from the south, you’ll see a large cinder cone volcano next to the highway. As you get closer to the volcano, watch for a small sign that says “Fossil Falls.” That’s your turn. If you pass the volcano, you’ve gone too far. Take Cinder Road, which is unpaved, to the parking area, where you’ll find a restroom and picnic tables. Cinder Road is flat and negotiable for most cars. A short trail leads to the falls. Wear good walking shoes; the trail is somewhat rugged although it should be no major problem for prudent able-bodied hikers. Orange arrows painted onto the rocks point the way. Fossil Falls is an unusual, otherworldly place that you won’t soon forget. Whether you plan on picnicking, hiking, rock climbing, night sky viewing or camping, you’ll enjoy your visit to this remarkable desert location.